Not many pictures with this post. Winter is upon us, just as I’m getting better at the biking. It’s not too hard to keep warm in mid-30’s (1-2) degree weather when you’re commuting. (45-50 Mph max). If I keep my trunk warm – wind shell in my outer jacket and a layer inside seems to be enough – then I’m pretty comfortable. Although I do need slightly warmer gloves. As long as you don’t have a “death grip” on the handlebars your hands will stay warm – though your fingertips may get a tad cool. The chill begins to penetrate at the high end of those speeds so real highway riding would require more layers. SMIDSY (sorry mate I didn’t see you) accidents seem to be the biggest hazard so far. Atlanta drivers tend to slip into tiny gaps in stopped traffic so that they can turn into the other direction. You can’t see them because the other cars are blocking your view and they aren’t looking for you. This drives me up the wall when I’m driving a car, but that would be only a fender-bender. The roads themselves aren’t too bad. There are a few places with perennial steel plates – which are a real headache, but the drivers seem to be aware that you might need to swerve around them. Stop and go volume delays are a royal pain. It’s not too hard to creep along, but unlike an automagic transmission, I have to use the clutch. I even managed an steepish uphill creep which is not bad. I like, scratch that, love being out in the air, but there are limits. Half an hour to go 300 metres is a bit much. 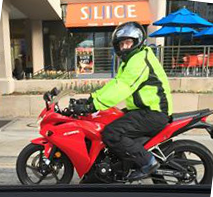 My little CBR250 looks too much like a scooter, so I have idiots trying to pass it because they seem to think I can only go 25. Usually I let them by because it isn’t exactly smart to get into an argument with 2 or more tons of steel cage. There is no point in pushing the speed to 50 just to slam into a stopped car in front of you, is there? Best to leave the game of chicken to the bird-brains. The one defensive thing I do all the time is to look quite far ahead on the road. I do that when driving and probably more when riding simply because I get a much better view.